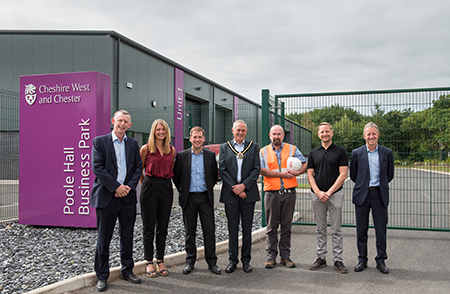 Deputy Mayor of Ellesmere Port, Councillor Paul Donovan has visited Poole Hall Business Park on Poole Hall Road, Ellesmere Port. 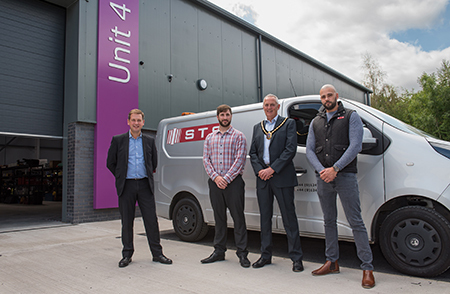 The four new industrial units were built using the Council’s Property Reinvestment Programme (PRP). Cheshire West and Chester Council completed the units twelve months ago; they were all let within a few months of completion to local expanding businesses. Councillor Donovan met engineering company, Specialist Technical Services (U.K) Limited who have expanded from the 2,500 sq ft Unit 3 into the 5,000 sq ft Unit 4. Their original Unit 3 has been re let. The business park provides much needed medium sized units which have been lacking in the local market. Councillor Donovan said: “Our Property Reinvestment Programme works hard to redevelop areas and property that is no longer fit for purpose. PRP uses the receipts from sales of Council commercial premises and reinvests the proceeds into redevelopments and investments to improve the property portfolio and the help meet our income targets. PRP is currently undertaking further redevelopments including new industrial and trade counter units at Dee View Trade and Business Park on Bumpers Lane, Chester. The industrial units are part funded by the European Regional Development Fund (ERDF). Dee View Trade and Business Park (former Central Depot on Bumpers Lane) is a £4 million redevelopment and regeneration of a vacant and redundant former depot which in Phases 1 and 2 will deliver 20,000 sq ft of new industrial units and 20,000 sq ft of Trade Counter units plus a new estate road. This development started on site in January 2018 and will complete in January 2019. The industrial units were part funded via PRP and ERDF monies which enabled the Council to provide ten 2,000 sq ft small industrial units for growing SME’s. Road 2 Business Park, Winsford is a 5,600 sq ft industrial development providing four small industrial units. The redevelopment of the redundant site started in January 2018 and is due to complete in September 2018. The industrial units were part funded via PRP and ERDF monies which enabled the Council to provide small units for SME’s. Duttons Business Centre, Northwich is a 10,000 sq ft industrial development due to be completed in December 2018, providing four 2,500 sq ft units. The industrial units were part funded via PRP and ERDF monies which enabled the Council to provide small units for SME’s. If you are looking for a property for your business contact the Council’s Property Services on 01244 977176 or 01606 271537 or visit the Property Services on the Council’s website.